Ensuring data is secure and well managed so risks to the organisation are contained. Preventing and correcting errors in data as part of a continuous improvement plan. Measuring data quality and providing a framework for data quality improvement that is monitored and assessed. Defining the standards to document data and its usage within an organisation. Acting as the escalation and decision making body for significant data related issues/change. These add up to the concept of ‘fair access to data for all’. This underpins the concept of data being viewed as an organizational asset, and not within silos. 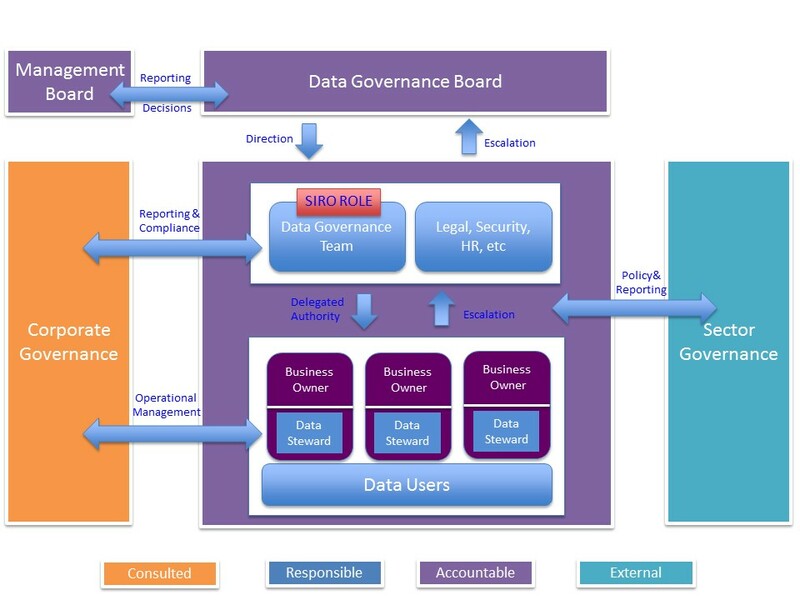 Within the data governance framework a number of key roles need to be defined and allocated. It is important to remember that these are roles and not jobs. Here we set out generic governance activities and the scope and extent of their responsibilities. University data trustee The university data trustee is accountable for the strategic co-ordination of data management and reporting. The role is performed by a member of senior management such as Director of Planning or Registrar. The university data trustee takes a governance role, ensuring that data management activities are optimised in order to align to and support both strategic and operational objectives. Data owner The data owners are accountable for the fitness or purpose of a defined data areas (sometimes known as a data domain). This role is primarily performed by the leads of those functions (Finance, Estates and Staff. See the Data Ownership Template for advice on the Student data owner). The data lead takes a governance role, ensuring data within their domain (no matter where stored) is fit for both operation and strategic use on behalf of the university. Data stewards The data stewards are responsible for the definition and quality of defined dataset(s) within a data area (e.g. admissions data within the education data domain). The focus of this role will be defining the meaning of data and determining the relevant data quality checks and controls to maintain data quality in line with the university's operational and strategic needs. Data consumers Data consumers are responsible for defining which data they require and what makes that data of sufficient quality to use. This role is primarily performed by the individual functions and departments with requirements for data, this role may also be performed by senior system owners (business) where data supports operational processes. The focus for this role will be to input into defining the data required, setting business rules and quality standards. These roles can be extended to include systems through business and technical owners. Such roles are not generally required for smaller institutions and are not included here. Allocating data ownership to the student record is difficult. This is primarily because the student can have so many different ‘roles’ as they move through the institution. One approach is to split the ownership based on functional expertise around individuals roles as demonstrated in the Data Ownership template. To get started, allocate the functional responsibility and then allocate the roles using the guidance above. One way to tease out data owners and stewards is to complete a data map. Many models for data governance exist, depending on organisation design and management structure. The model below can be considered a generic model with all the functions and roles represented. This model will require modification for individual organisations but is made up of best practice across both HE and other sectors, so should be considered a starting point. Whichever model is chosen data governance must be considered a shared service for the whole organisation. It has no value operating in isolation or being ignored by one or more functional areas. Much of the success of data governance can only be driven top down by a senior sponsor.